The summer holidays are coming to an end and Portsmouth parent’s might have run out of ideas to entertain their kids. If you’ve been to the beach too many times already this summer and don’t want to spend a fortune – after buying all the back to school gear – we’ve rounded up seven free activities in Portsmouth. With the weather set to be sunny and warm again this weekend, you might fancy a final family adventure or day out before the new term begins. Never fear because we have rounded up seven great free activities to do in Portsmouth this weekend which will keep the whole family occupied. Portsdown Hill has spectacular views across Portsmouth and the harbours, as well as the Isle of Wight. It has an open network of paths which take walkers through wild-life rich habitats and flowery grassland, including birds such as kestrels. There are also a number of forts which were built to defend the port from attack and Fort Nelson has been restored as an artillery museum which is free to enter. Making it the perfect place for your kids to burn off their energy! Built in 1544, right by the sea, the castle was one of the fortifications built by Henry VIII to protect the coast from invaders. However now it is open to the public for free. Between March and October, visitors are able to explore the historic Southsea Castle, which is home to a cafe, gift shop and micro-brewery. In the 19th Century a tunnel was built to defend the castle moat. Visitors can still enter the tunnel and see how the castle would have been defended against invaders. Artillery, gun platforms and panoramic views from the top of the keep overlook the Isle of Wight and Solent. Who says you can’t do a bit of learning while school is out. The cafe also offers a Champagne bar on Friday evenings – after all taking care of your children is thirsty work! It is free entry to Portsmouth City Museum for visitors, although donations are welcome. Portsmouth City Museum is the ‘museum of and for the people of Portsmouth’ and features a variety of exciting displays including the Story of Portsmouth - which has reconstructions of a number of rooms from the cities history, including a 17th century bedchamber. There is also A Study in Sherlock and many other exhibitions. At this museum visitors can explore many different types of habitats. Portsmouth is a very special place for wildlife in Britain and has many different habitats in a very small area. Displays include dinosaurs, an A to Z of Natural History and a working beehive. There is also the Butterfly House which is home to a huge array of neo-tropical butterflies, including swallowtails, morphos and owl butterflies. It is open Tuesday to Sunday, and closed on Monday. This popular park dates back to 1866 and has a man made lake with pedal boats for hire. Canoe Lake is also home to a large and very popular children’s play area with equipment for all ages and includes a zip wire, sand pit and water area. There is also a Model Village where everything is on a miniature scale and is known as a swan’s nursery as it is one of the mute swans’ chosen sites in the Solent. At times up to 60 juveniles can congregate here for comfort and security during the winter. Located in Old Portsmouth this historic church dates back to 1212, so is steeped in history. It is thought to have been built by the Bishop of Winchester of a hospital and hostel for pilgrims. King Charles II was actually married here in 1662. If you are looking for a few moments of peace after a hectic day exploring Portsmouth, then the church is open to the public Tuesday to Saturday. The Royal Garrison Church was badly damaged in a 1941 firebomb raid on Portsmouth but the chancel survived. 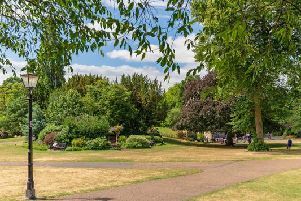 Located in the centre of the city this 15 acre park is hard to miss and is the perfect place to go for a quiet walk, have a picnic or if you have young children - burn off some energy in the adventurous play area. There is also an aviary with peacocks, parrots and other exotic birds, in addition to another area with rabbits and guinea pigs that children can feed.